I was born in Santiago de Chile, 1985. I studied Physics Engineering in the University of Santiago de Chile until 2012. My specialization was focused on environmental and air quality measurements, so during my early years, I worked in air quality studies at University of Santiago, Ministry of Health of Chile and Centro Mario Molina Chile. In 2014, I started working with Prof. Raul Cordero and his group in the Physics Department of the University of Santiago de Chile, as head of the Laboratory of Radiometry and Photometry. I was in charge of the calibration of radiometric sources and spectroradiometers by using a 1000W tungsten lamp and by traceability with 120W lamps for fieldwork. 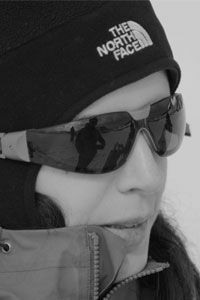 Our work was focused on albedo measurements in Antarctica and characterization of the solar spectrum in the Northern Chile. In between, I worked in The University of Chicago (January until end of March, 2013) with Prof. Douglas MacAyeal and his group, in supraglacial hydrology on floating ice shelves. In March 2016 I got the DAAD scholarship for doctoral research, with the project: „Role of the clouds on the Energy Balance on the Antarctic Peninsula Ice Sheet“, supervised by Prof. Dr. Matthias Braun and Prof. Dr. Thomas Mölg. Banwell, A. F., Caballero, M., Arnold, N. S., Glasser, N. F., Cathles, L. M., MacAyeal, D. R. (2014). Supraglacial lakes on the Larsen B ice shelf, Antarctica, and at Paakitsoq, West Greenland: a comparative study. Annals of Glaciology, 55(66), 1-8. Antarctic clouds, remote sensing, radiation, atmosphere-cryosphere interaction Currently, my research interest is to improve our understanding about the role of the low clouds (namely, with tops up to 10 km) on the energy balance of the Antarctic Peninsula. It is known that clouds warm the surface, exerting a greenhouse effect, and cool the surface, reflecting back the solar radiation. In the Antarctic Peninsula, rapid changes are been observed: increase of air temperature, changes in glaciers, such as disintegration of ice shelves. Nevertheless, clouds remain challenging to represent well in mesoscale and global climate models, specifically in polar regions. In particular over the large ice sheets, ground-based cloud monitoring is still difficult because of the remoteness and the hard access due to weather conditions. Through the analysis of ground based data, I am studying the skills of satellite data algorithms retrieving cloud properties. The ground based data is taken in two Research Stations: Escudero (62° 12′ 57″ S, 58° 57′ 35″ W, King George Island) and O’Higgins station (63°19′ S, 57°51′ W, Antarctic Peninsula). Late November 2017, a team of FAU Erlangen-Nürnberg and the University of Santiago de Chile went to O’Higgins and Escudero stations (respectively) to do radiosoundings and measuring cloud properties with a mini Micro Pulse Lidar.